Oman Air outlook Pt 2: can rapid growth, airport upgrades and transit traffic lead to profitability? Oman Air is aiming to significantly narrow its losses over the next two years and be at least break-even by 2017 despite pursuing rapid expansion. The airline has accumulated operating losses of around USD1 billion over the last four years but is banking that achieving higher levels of scale and improving productivity will enable it to become profitable. However, Oman Air will have to overcome huge challenges and intensifying competition as it rapidly expands its fleet and network. The government-owned flag carrier will need to further increase its reliance on transit traffic, which already accounts for 60% of its passenger traffic. There will be opportunities to grow transit traffic, particularly in the Asia-Europe market, as its hub airport is upgraded and several new destinations are added. But Oman Air will need to succeed in a sector that has become extremely competitive and is generally low-yielding. This is the second in a two-part series of analysis reports on Oman Air. The first report took an in-depth look at Oman Air’s new fleet plan. This report examines Oman Air’s recent performance and overall outlook, in particular its pursuit of more transit traffic, as it continues to expand rapidly. Oman Air reported on 28-Mar-2015 an operating loss of OMR96 million (USD249 million) for 2014, representing a 4% reduction compared to 2013. Revenues increased by 4% to OMR398 million (USD1.035 billion). RPKs were flat while passenger numbers increased by 2% to 5.1 million. ASKs were up 2%, marking the lowest rate of capacity growth in over 10 years, as the flag carrier’s load factor dropped 1.6ppts to 74.4%. Oman Air has grown rapidly since it shifted its business model in 2007, becoming a widebody operator and a full-fledged flag carrier with an intercontinental network. Previously it was a small but (modestly) profitable short-haul regional carrier. While revenues have since nearly tripled, Oman Air has accumulated more than USD1.4 billion in operating losses over the last seven years. Annual operating losses have been at or approaching OMR100 million the last four consecutive years, leading to an accumulated loss of about USD1 billion since 2010. 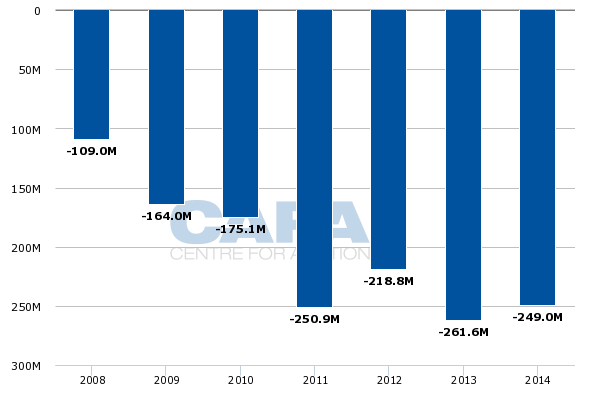 Accumulated revenues over the last four years have totalled about USD3.7 billion. An average operating margin of negative 27%, including negative 24% in 2014, is clearly unsustainable. Oman Air CEO Paul Gregorowitsch is confident the flag carrier will significantly narrow its loss in 2015, citing productivity and efficiency improvements. 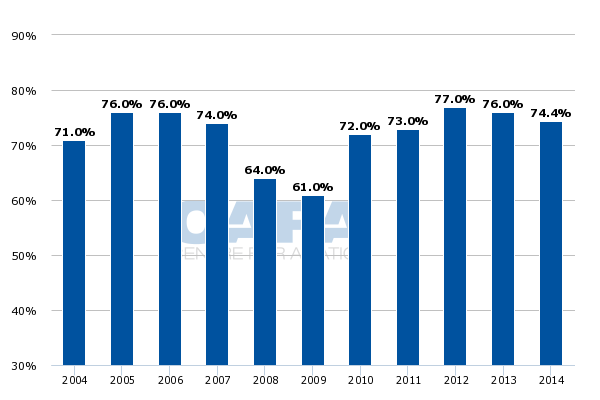 The airline plans to grow ASKs by 35% in 2015 while staffing numbers increase by only 13%. Streamlining the fleet as regional aircraft are phased out will also boost efficiency levels while higher levels of scale are gradually being achieved as the overall fleet and network expands. But the reality is the sharp reduction in fuel prices will be the main driver to any improvement in Oman Air’s financial performance in 2015. The bigger test will come in 2017, when Oman Air is expected to break-even or generate a small profit. Oman Air will undoubtedly be a more efficient and productive airline in 2017, at which point it be well advanced towards its 2020 objective of operating 70 aircraft to 75 destinations. But generating sufficient revenues and yields to be profitable at its projected 2017 size of 50 aircraft could pose a challenge. Rapid capacity expansion over the next three years will lower unit costs but will likely put pressure on yields and load factors. Even with ASK growth of only 2% in 2014 Oman Air’s load factor slipped to the lowest level since 2012. Oman Air will need to rapidly grow transit traffic, particularly traffic to or from Asia, as it expands. While demand in the Asia-Europe and Asia-Middle East markets is expanding, Oman Air will need to grow its share of these markets at a time other larger airlines are also aggressively adding capacity. Oman Air’s initial expansion into intercontinental services, beginning with Bangkok and London in late 2007, was part of niche strategy aimed at the point to point market. But as Oman Air has expanded its long-haul network along with its medium-haul network to South Asia it evolved away from this niche and into the more competitive transit market. Further expansion firmly positions Oman Air as a full-fledged network carrier, intensifying competition with Emirates, Etihad and Qatar Airways. Mr Gregorowitsch told CAPA at a 30-Mar-2015 launch event in Singapore that transit passengers now account for 60% of Oman Air’s total traffic. This includes about a 50% share of passengers in the Indian market. India is now Oman Air’s largest market with 11 destinations accounting for about 25% of its total international seat capacity. Oman Air sees an opportunity to further grow its transit traffic after a major upgrade project at its Muscat hub is completed in 2016 with the opening of an extended runway and new terminal. The new terminal will resolve the current constraints on gates and remote parking spots, which currently prohibits Oman Air from pursuing expansion during its main eastbound and westbound banks. Oman Air is now able to schedule 60% of its flights within a two-hour window. Services from five of its six European destinations (the exception is Munich) arrive at Muscat in the early morning while connecting flights to South Asia and Southeast Asia depart in the mid to late morning. All flights from Southeast Asia and some South Asia services arrive at Muscat around midday and connect to flights to Europe which depart in the mid afternoon hours. Both banks connect in both directions with regional flights within the Middle East. The new airport at Muscat will enable Oman Air to further expand its two banks while improving the transit experience for its passengers. The current airport is now a major weakness, particularly given Oman Air’s focus on service. Oman has been working to boost its tourism sector and the investment in expanding Oman Air and the Muscat airport is part of this initiative. Oman has seen encouraging growth in inbound visitor numbers, including 12% growth through the first nine months of 2014. While visitor numbers will continue to rise, it is unlikely to grow as fast as Oman Air’s capacity as the flag carrier doubles its fleet and adds nearly 30 destinations over the next six years. A large portion of this growth will be allocated to the Far East, which is a very small source market for Oman. Oman will be working to develop tourism in East Asian markets such as Singapore, China, Japan and Korea. But it will take time – and a lot of hard work – for Oman to be recognised as a tourist destination in these markets. Daily services to Singapore were launched on 29-Mar-2015 while Oman Air is planning to launch services to a soon to be disclosed destination in mainland China in 4Q2015. Tokyo and Seoul services are expected to be launched in 2016 or 2017. Oman Air will need to rely heavily on transit traffic beyond Muscat as these new destinations open up, particularly given the relatively large amounts of capacity that will be provided. For example Oman Air launched daily A330-300 services to Singapore on 29-Mar-2015 with about 1,200 weekly one-way seats available to the Singapore market. Oman Air has allocated the other approximately 800 weekly one-way seats on the Muscat-Singapore-Kuala Lumpur route to the Malaysian market. Oman Air previously served Kuala Lumpur non-stop but decided to add a Singapore stop in both directions and focus on Singapore as the priority because Kuala Lumpur was consistently underperforming. Oman Air is optimistic Singapore will do well and is particularly encouraged by its initial performance in Manila, which was launched in Dec-2014 and is currently served with three weekly flights. But Singapore is a completely different market than Manila. Mr Gregorowitsch said only 38% of Oman Air’s Manila passengers to date have connected beyond Muscat. Of the 62% point to point component, 42% is labour traffic (Filipinos working in Oman) and 20% is business traffic. Most of the transit passengers from Manila are connecting to other destinations in the Middle East although Oman Air also has seen a large volume of passengers heading between Manila and Paris. With Singapore, Oman Air will have to rely significantly more on transit passengers. Singapore-Oman is a tiny market with very few Omanis visiting Singapore and even fewer Singaporeans visiting Oman. Singapore-Middle East is also a relatively small market. Oman Air will need to rely mostly on transit passengers to Europe, but Singapore-Europe is a highly competitive market. Emirates and Qatar Airways in particular have a large and expanding presence in Singapore along with well established brands while Oman Air is relatively unknown. Singapore will be an interesting test case for Oman Air, providing some potentially important lessons as it prepares to launch services to China and eventually Japan and Korea. Oman Air could end up facing some of the same challenges that impacted its performance in Malaysia, where it also faced stiff competition in the Malaysia-Europe market from the main Gulf carriers. A codeshare with Malaysia Airlines (MAS), which still provides Oman Air with connections beyond Kuala Lumpur to six domestic and three regional international destinations, also was unable to generate enough traffic to sustain non-stops to Kuala Lumpur. Oman Air is keen to leverage the Singapore hub and forge interline and codeshare partnerships with airlines serving Singapore. But accessing seats beyond Singapore at competitive rates could be difficult, limiting Oman Air to the Singapore-Middle East and Singapore-Europe markets. The expected addition of China, Korea and Japan would give Oman Air seven destinations in East Asia, up from only two destinations three months ago (Bangkok and Kuala Lumpur). In addition to Manila, Jakarta was added in Dec-2014 and is currently served with four weekly flights. Bangkok, which along with London was Oman Air’s original long-haul destination, is served daily. London and Munich are also served daily, while Frankfurt is served with six weekly flights and Zurich and Paris with four weekly flights. Oman Air is planning to focus long-haul network growth on Asia although it is aiming to add a second daily flight to London from Oct-2015 and is keen to upgrade Paris to daily if Oman can persuade France to expand their air services agreement. Oman Air also plans to use KLM for connections beyond Amsterdam to the US while KLM will use Oman Air for connections beyond Muscat to India. Oman Air currently only codeshares with one European carrier, Turkish Airlines. But the Turkish partnership only covers Turkish’s Muscat-Istanbul route. Oman Air does not currently have any codeshares to North America and its MAS codeshare is the only partnership covering flights beyond any of its destinations. All of Oman’s other codeshare partners – Emirates, Ethiopian, Royal Jordanian, SriLankan Airlines and Qatar Airways – are limited to flights between Muscat and the hub of the partner. Oman Air will need to continue growing its partnership portfolio as it expands, particularly in Asia. The Asian market already accounts for nearly half of the carrier’s total international seats. More partnerships should enable Oman Air to expand its offline network and attract higher yielding passengers. This is particularly important given the carrier’s premium focus. Partnerships are also an important part of the Oman Air strategy for its cargo, handling and catering businesses. Oman Air recently signed a partnership agreement with Cargolux, which will start serving Muscat from Luxembourg and India on 15-Apr-2015. Oman Air has been discussing establishing a cargo handling joint venture with Singapore Airport Terminal Services (SATS). Oman Air looked in 2014 at spinning off its handling and catering businesses as part of a corporate restructuring. But it has since decided to keep the units in house and instead pursue joint ventures or other partnerships. Oman Air is entering a critical phase as it pursues rapid expansion, prepares for the highly anticipated opening of its new hub airport and tries to improve its financial position ahead of its 2017 break-even target. Oman Air also faces the prospect of new competition in its home market as the government is aiming to select within the next few months and eventually license a potential second local airline which would follow a budget carrier model. 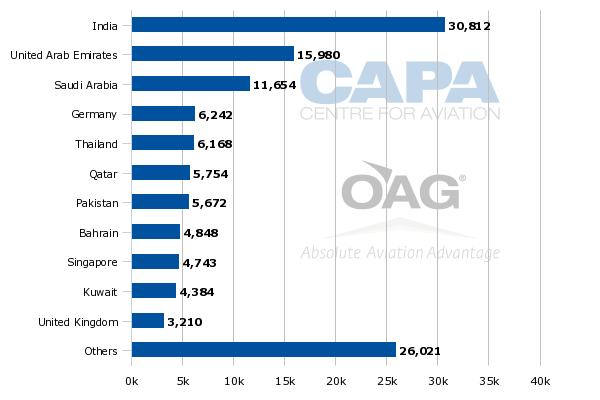 Foreign LCCs currently account for 14% of international seat capacity at Muscat, according to CAPA and OAG data. 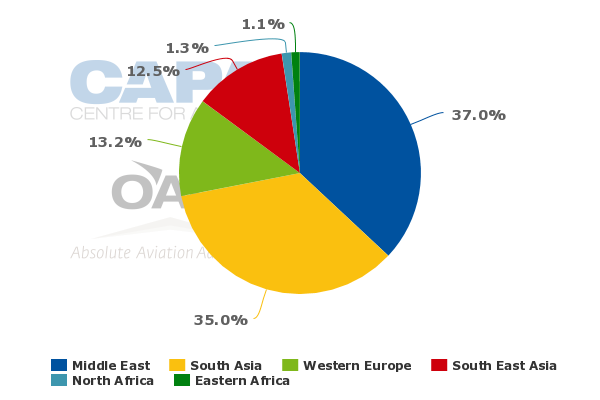 Foreign full-service airlines account for 34% while Oman Air has a 52% share of international seat capacity at its hub airport. While a local LCC would likely stimulate growth, the Omani market may not be large enough to support two local airlines. Oman Air’s ability to grow and become profitable would also almost certainly be impacted if a second Omani airline commences operations. Growth in India, where Oman Air already faces competition from Indian LCCs, would particularly become difficult as Oman Air would have to potentially share precious traffic rights with the new Omani LCC. Oman Air already faces bilateral constraints in India and is banking on a new air services agreement to enable it to pursue further growth in its biggest market. The Omani government has been very supportive of Oman Air, recapitalising the flag carrier several times and funding its current expansion plan. But ultimately the airline is expected to be sustainable. An Omani LCC would add to an already long list of challenges that Oman Air needs to overcome if it is to succeed at becoming a profitable entity.